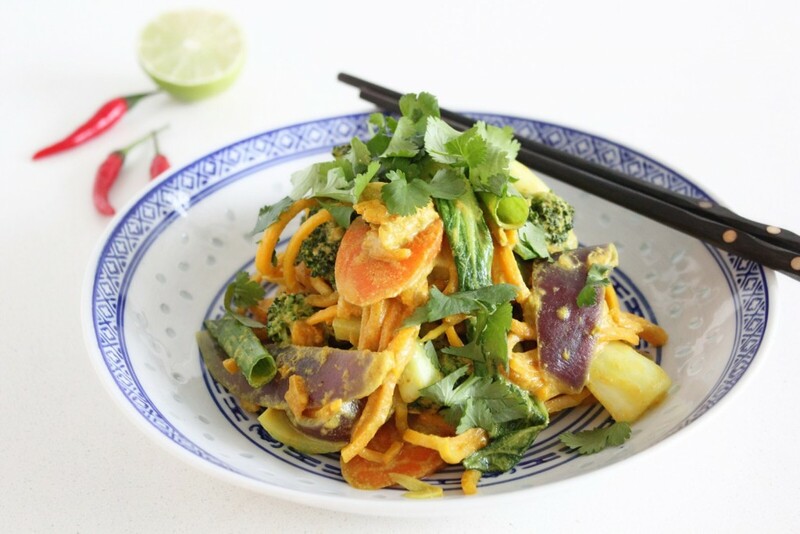 In case you are like me and have cravings for Indonesian peanut noodles a little more than you would like to admit, I wanted to share a version with you that leaves you feeling energized and smugly vegetablized instead of Netflix zomb-ified. 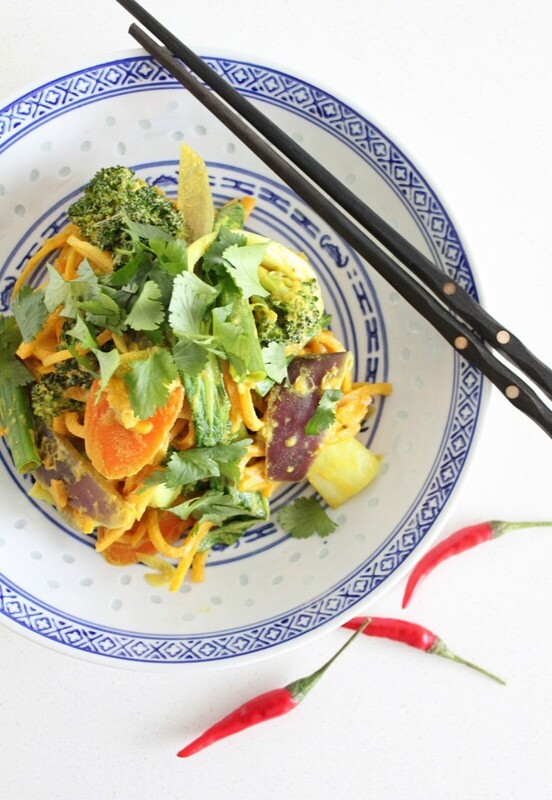 The first and most important thing we do is make it more about the veggies than the noodles (good life advice too). Then we remove the peanut butter (sad face, I know, but pb -even organic -contains aflotoxin, a known carcinogen produced by mold) (I still eat it once in a while when accompanied by chocolate, because I’m human) and replace it with pumpkin seed butter (or sunflower seed or almond) (you won’t miss the peanut butter, I promise). We remove the sugar from the sauce too and replace it with whole fruit, and add some flavour-ly appropriate but somehow traditionally absent turmeric to boost the anti-inflammatory powers that the ginger and garlic were already bringing to the party. 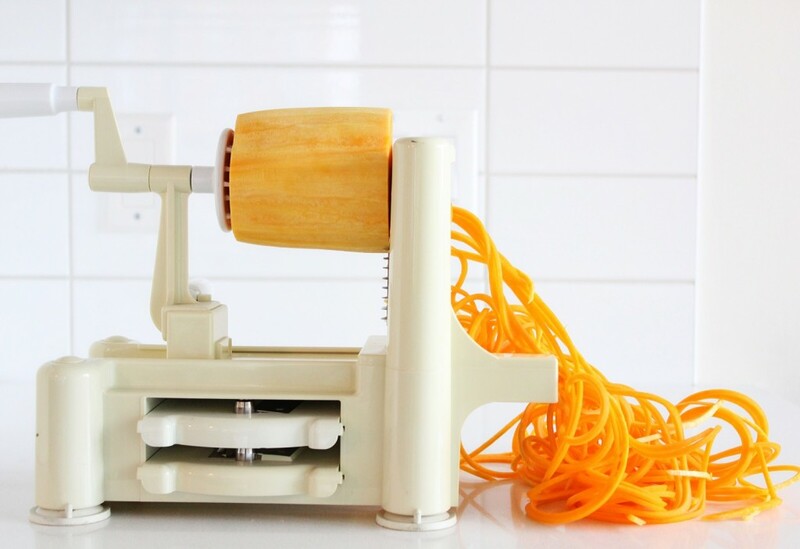 Then we swap out the noodles entirely for veggie noodles (with the help of a spiralizer, the funnest kitchen tool of all time, the adult equivalent of the Play-Doh Fun Factory). 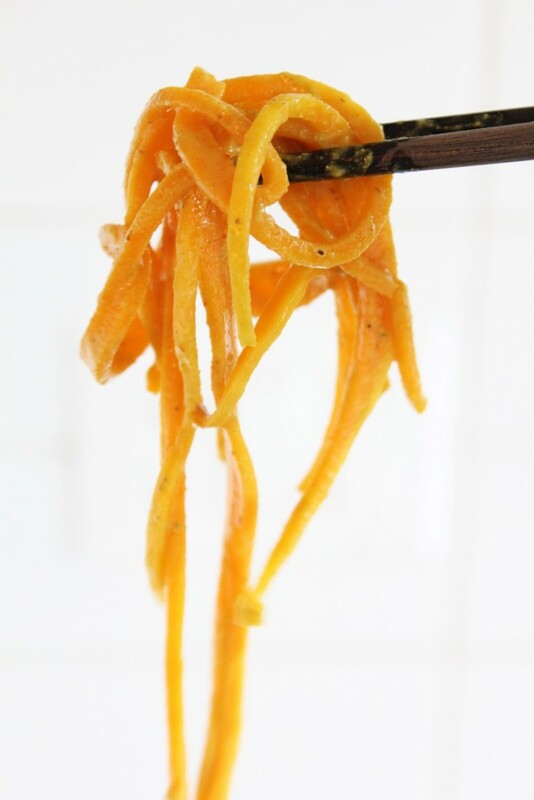 I used butternut squash for the noodles, which never get completely soft, but do a pretty good job in this recipe (make sure to a squash that has a long, straight neck for easy spiralizing). 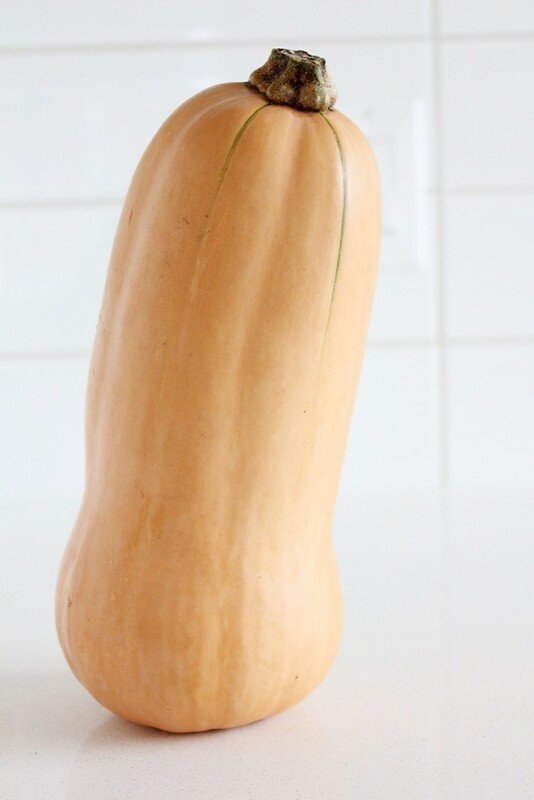 Feel free to use zucchini instead, it works very well (as seen here and here) (keep in mind it will release more water) and sweet potato noodles would taste good too (although sweeter, obvs). As much fun as it is to have veggies shaped like noodles, it isn’t a necessary factor in making a deliciously satisfying version of this dish. Not everybody has a spiralizer/wants to dig out and then wash their spiralizer, which I totally get, but have no fear, you can make this without the veggie noodles and eat it as is or serve it on a bed of steamed whole grain rice (or quinoa or buckwheat). You can also use actual noodles (for a treat) in place of the veggie noodles, but instead of traditional egg noodles use g-free soba or a clean brand of rice noodles and of course make sure there are way more veggies than noodles. Water is your secret ingredient in this recipe. 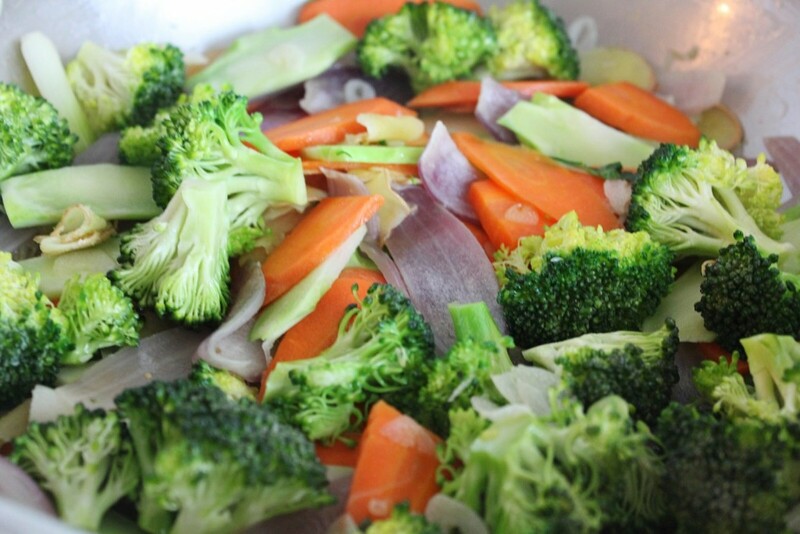 You may need to add a little here and there or a lot, depending on your stove setting, the water content of the veg you choose, and how much you cook it. I understand the comfort of exact quantities in recipes, but this is one of those ones where you have to eyeball what’s happening, and add water when the sauce tightens up and sticks to the bottom of the pan. The consistency you are looking for is that of a creamy pasta sauce. This dish, made as it is, might be the largest volume of veggies you can pack into a meal (without blending them into a smoothie). 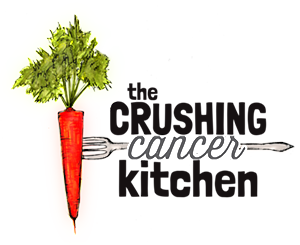 It tastes best made with cancer-crushing cruciferous veggies (broccoli, kale, bok choy, cauliflower), which is pretty convenient too, for obvious reasons. It’s basically a winter salad –tons of veggies, warmed up with heat and warming ingredients (but don’t think of it that way if it will make you miss the comfort food feelings that are definitely in there too). 4 c Veggies (a combo of broccoli, bok choy, gai lan, kale, cauliflower, carrots, mung sprouts, snap/snow peas, kohlrabi, mushrooms), cut into bite-sized pieces. 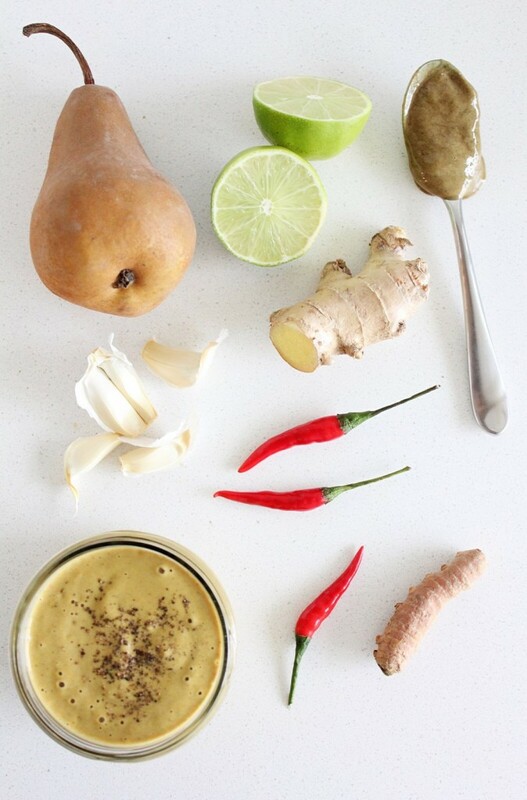 Blend all ingredients together in a blender until very smooth. In the coconut oil and a splash of water in a large pan, sauté the onion until it softens and then add the ginger, white parts of the green onions and garlic, continuing to sauté for a minute (until it becomes fragrant). 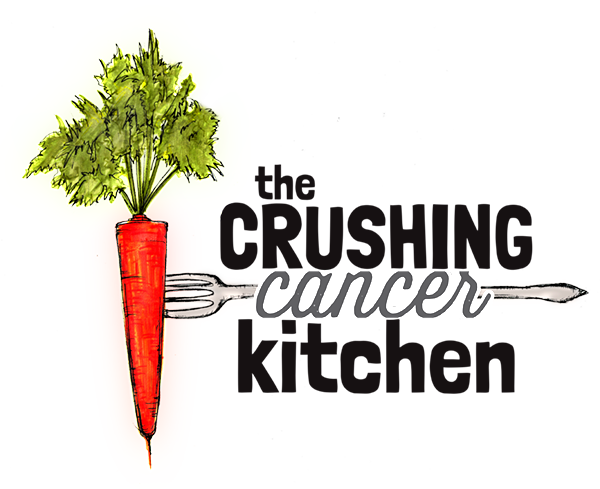 Add the carrots (and any firmer veggies) and a splash of water if it has dried up. 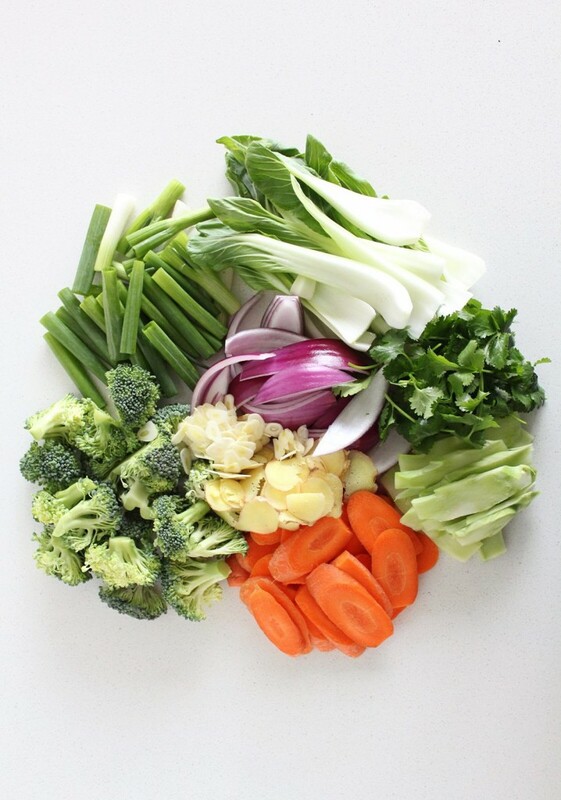 Add the firm firm green (broccoli, kohlrabi, broccoli stems, gai lan etc.) and let it sweat while you sauté for a couple of minutes until they start to brighten up. Add the noodles and sauce and stir as it all warms up and the noodles start to soften. Once the veggies and noodles are almost cooked perfectly, add the leafier greens (bok choy, kale, spinach, swiss chard etc) and add a splash of water if needed and put a lid on top to let them steam. Adjust the sauce consistency with water (it should be the texture of a creamy pasta). Add the cilantro to the pan. Serve in bowls with a squeeze of lime and an extra generous pinch of cilantro.